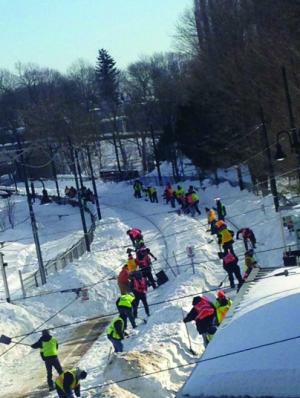 Mattapan Line: Workers labored to clear the Mattapan trolley tracks near Milton station over the weekend. Service resumed on the trolley line on Monday after weeks of being off-line due to snow and ice. Photo courtesy Ellen Berlin Commuters on the Mattapan Trolley line are breathing a sigh of relief, after nearly a month out of service, the line is up and running–five days ahead of schedule. The 2.6 mile trolley line connecting Mattapan Square to Ashmont Station had service suspended since Feb. 2, with intermittent service prior to that, all due to Boston’s barrage of storms over the last month. Shuttle busses wound passengers up and down Dorchester Avenue. Kirk Hazlet, who takes the trolley daily in his commute from Belmont to Curry College, was not aware trolley service had resumed this morning and missed the first one he could have taken, but when he got on the next car,things went smoothly, he said. At first, “Took a few days for the MBTA to get their act together,” with one shuttle bus replacing three or four trolleys, said Hazlet, 69, but gives the MBTA credit for resolving the issues. Cullinane said he and the rest of the Dorchester delegation have heard a great deal from constituents about inconsistence train service. He plans to see what Gov. Charlie Baker’s "advisory council" tasked with assessing the T's governance, finances and operations finds when it present findings and recommend fixes for the transit system by the end of March. The seven-member council includes Dorchester resident Bob Gittens, vice president of public affairs at Northeastern University who served as secretary of health and human services for former Acting Gov. Jane Swift. “More than anything else, this is a problem that has come about because of lack of investment over time,” Cullinane said, adding he would focus on a funding fix. On March 3, the MBTA will review “a series of options” to reimburse passengers for their fares due to the month of service delays and shutdowns, according to an email from MBTA General Manager Beverly Scott. A final recommendation on fare reimbursement will be brought to the next meeting of the MassDOT Board on March 11. Scott will step down from her post on April 11, a surprise move she announced two weeks ago.